Some riders love it while others loathe it, but putting your time in on the trainer is a must for the majority of riders that are preparing for the first races of the 2016 cycling season. Riding your trainer involves more than just hopping on and turning over the pedals. 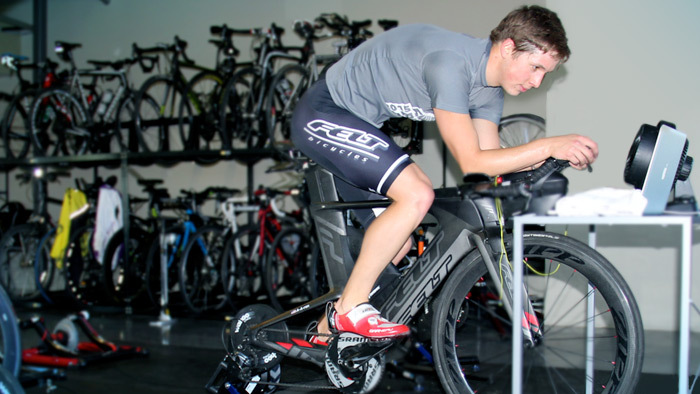 There are a few key points to start thinking about now as you develop your indoor trainer plan. Getting and staying motivated and having a proper trainer set-up are pillars upon which to build your trainer workouts. If you can maintain those pillars, the final component you need is a structured training plan. Unless you are training for Iditabike, you probably want to do something other than stare at a white wall when on your trainer. Try to have some sort of entertainment when you ride. Music, watching TV or a movie, or even watching bike races are all good options. Have the entertainment mood match your ride. Create playlists for recovery rides, tempo, and interval sessions. Or, watch an action packed movie when doing intervals. All of the above will help the time go faster which can make a huge difference when you are staying in one spot pedaling in circles. The faster the time goes, the sooner it will all be over. Make sure you have proper ventilation or air movement when you ride indoors. If your body starts to overheat, especially doing harder efforts, it can essentially shut itself down thereby hindering the work you are trying to do. Riding inside, you don’t have the benefit of the wind rushing over you. Ride in a cool room. Set up a fan or two that blow on your torso and legs. Most ceiling fans do not provide enough of a cooling benefit. Use box fans or a good oscillating fan, or both. Finally, dress with the essentials when you are on your trainer. Wearing too much clothing will prevent your body from keeping itself cool. There are those that love the trainer so much that when the nice weather finally comes around you have to pry them off the trainer to get them outside. For the rest of us, finding a balance between riding indoors and outdoors keeps us sane. Every time you climb on your trainer you drain your “mental battery” just a little bit. Your mental battery is that inner strength, or mojo, that you have to produce to get the necessary work done. During the winter months, it is important to get outside when you have the chance. Being outdoors allows you to work hard indoors and keep your mental battery at peak capacity for quality training. If your goal is have solid base fitness by the middle of March when most spring events start, you should start structured training indoors by the middle of December. With this in mind, you want to allow three and a half to four months of indoor training in your schedule. You can continue the trainer sessions even while racing on the weekends. Just allow sufficient recovery following race days. Remember periodization. You want to work in three to four week blocks and then take four to six days of rest. Then resume training. Here is a structured plan to help you get started: Always: Do a 10 to 15 minute warm-up, a 1 X 5 at Lactate Threshold (LT), and at 95 to 100rpm cadence followed by a five minute recovery. One of the best ways to increase your LT is by doing 20 minute efforts at 92 to 95 percent of your LT. Do the warm-up as described above then do 2 X 20 at 92 to 95 percent of your LT and at a 90+ cadence. Do a 10 minute recovery between efforts with a 5 minute cool down to finish the 80 minute session. Monday through Friday: Two rides per week at 60 to 80 minute sessions. Do one or two effort days with a recovery day between. Weekends: One to two rides at 60 to 80 minutes per session. Do one effort day and one recovery day. Here, the interval duration is decreased but the effort intensity is dialed up. For the 10 minute efforts, do a structured warm up then do 3 to 4 X 10 minutes at 100 to 107 percent of your LT and at 90+ cadence with 5 minute recovery between. Monday through Friday: For first two to three weeks of phase, do one per week with other rides being LT, tempo or recovery. After initial two to three weeks do two per week. The 5 minute effort can be some of the most painful intervals. Short but very hard! After warm-up, do 4/5 X 5 at 110-118 percent of your LT and at 90+ cadence. Recovery time becomes very crucial here and should be at minimum 100 percent of effort time. Monday through Friday: By now, you are ready for multiple hard days in a week. You can mix in two per week. Weekends: One per weekend. Other day Tempo for 1 hour or 2 X 20 at LT. The final phase of your indoor training should be a mix of 1, 2, and 5 minute efforts. These will help peak your fitness as you approach the end of trainer season. You can do a ladder of efforts: 1/2 X 5 at 110-118 percent. Then 3/4 X 2 at 120 percent and 5/10 X 1 at 120-130 percent. Again, recovery times should be at minimum 100 percent of effort time. Due to the very high intensity of these efforts, it is important to work in frequent recovery rides during the week. Also advisable to do one LT ride every two weeks to maintain base fitness. Monday through Friday: Two per week. Other days being Recovery or Tempo. Weekends: One per weekend. Other day Tempo for 1 hour OR 2 X 20’s at LT. The indoor trainer is a great tool. Be excited about your training, make the time go faster with good entertainment and make sure you have a plan in place so that you are ready for the 2016 season.